Republican Senator Lindsey Graham has been in the spotlight after his speech ripping into Democrats in the Senate during the Kavanaugh hearing, but that isn't the only moment that has gone viral. During his speech at the Atlantic Festival Thursday in Washington D.C., Senator Graham let everyone know he thought Kavanaugh was treated like crap. Graham went on to say Thursday of Christine Blasey Ford, Kavanaugh's accuser, "I thought she was handled respectfully. I thought Kavanaugh was treated like crap." A portion of the audience at the Atlantic Festival Thursday booed Graham to which he said, "Well, boo yourself." 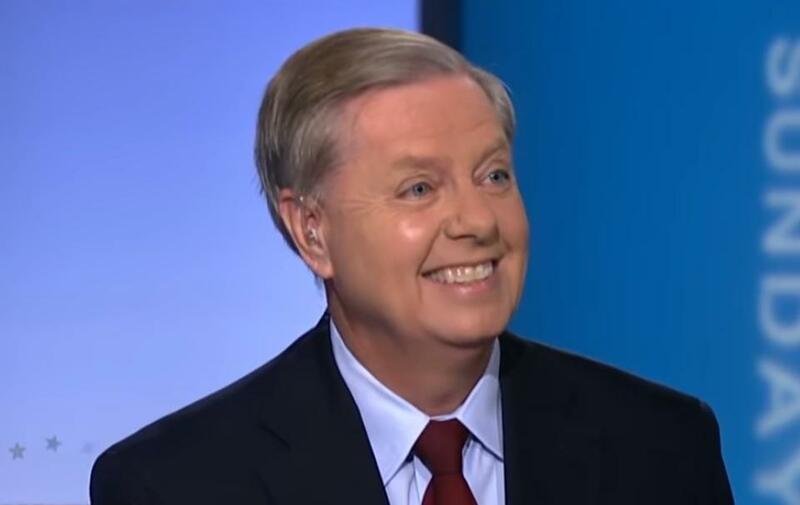 In an interview Sunday a Fox news anchor asks Graham why he looks so happy and he says, "I'm happy because a man I've known for twenty years who has never been banned from a mall, unlike Roy Moore, failed. I'm happy that those who tried to destroy his life fell short. I'm glad those who tried to overturn the rule of law and replace it with mob rule lost. I've never been more pissed in my life." He went on to say, "I voted for Sotomayor and Kagan, I would have never done this to them. This was character assassination, this was wanting power too much, and to the extent that I came to the aide of this good man and helped defeat this debacle I am happy as a clam." His response was similar to his original speech at the Kavanaugh hearing where he said, "This is the most unethical sham since I've been in politics." Graham previously told Fox news that Senator Collins' Kavanaugh speech was also influential. "I think she saved the Senate and the judiciary from sliding into the abyss," Graham said. Back to Sunday's interview, Graham was asked about whether he felt things were going to end with people still calling for the release of the FBI's interview transcripts and launching an investigation into alleged misconduct by Kavanagh. "Well, we'll know in November if that makes sense I hope everybody running for the house in these purple districts will be asked the question, 'do you support impeaching judge Kavanaugh based on five allegations, none of which could be corroborated?'" Graham goes on to ask his opposition, "Do you want an outcome to bad that you basically turn the law upside down. All I can say is this is going to the streets at the ballot box. I've never campaigned against a colleague in my life. That's about to change." Graham goes on to say, "I am going to go throughout this country and let people in these purple, red states where Trump won, know what I thought, know what I think about this process." Graham even carried with him to the interview a list of all the potential nominees and people that were ever on the list. When asked what the point of the list was, Graham responded, "Well, here's my point. This is a list that was compiled [by the President] in November but he actually put it out during the campaign." "There's twenty-something people on this list, I'm asking Chuck Schumer, 'Name five? Name three? Name one, that would d be OK with you'?" Graham asked. He goes on to say, "Brett Kavanaugh was a mainstream judge, I would have chosen him if I would have been president. Bush supported him, everybody running for president on our believed that Brett Kavanaugh and Neil Gorsuch were outstanding conservative jurors. The other side wants to cancel the election." The Senator asks his opponent, "So Chuck, if you want somebody new, look at this list and see if there's anybody you would agree to, but what you really want is to do senator Schumer is to overturn the election. If you want to pick judges than you need to win the White House." Here is where Graham loses me for a bit, he goes on to say how he voted for two judges that Democratic president Obama picked. "So Chuck Schumer, name one person on this list you think is acceptable?" The senator was recently attacked over his outrage moments caught on camera. One article titled, "Lindsey Graham Is the Saddest Story in Washington." Frank Bruni, the author behind a New York Times article on the senator said, "I can't think of another Republican whose journey from anti-Trump outrage to pro-Trump obsequiousness was quite so illogical or half as sad." Bruni goes to mention that Graham is even trying to audition to replace Jeff Sessions as Attorney General. Graham's response to the article was great, he said, "Frank you don't know what you're talking about. In your world Frank it's a noble cause to destroy a judicial candidate who is conservative whether it be Thomas, Alito, and now Kavanaugh." He goes on to say, "I'm bipartisan when it makes sense, I try to have a good disposition because I like my job, but mistake that I don't care about the conservative cause. So if I made you upset because I would not legitimize McCarthyism than good. I think I can survive in South Carolina." Graham has proven he isn't afraid to come forward when he needs to, and he is serious about his convictions as this video shows. The Senator has been mocked relentlessly by the left-wing media complex through shows such as SNL. With McCain finally gone and Trump at the reigns, limp-wrist Linsay has permission to be a man.